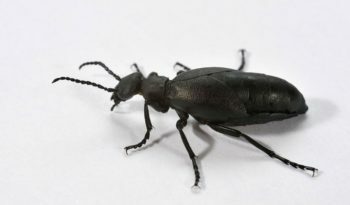 The Milkweed Beetle (Tetraopes tetrophthalmus) belongs to the family Cerambycidae, which includes the Long Horned Beetle. The Milkweed Beetle derives its name (tetraophthalmus – Latin for ‘four eyes’) from the curious structure of its eyes. 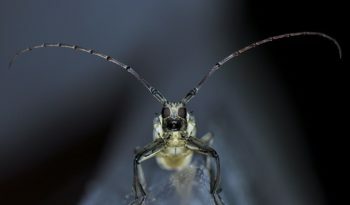 As in many Longhorn Beetles, the antennae are situated very near the eye. In the Milkweed Beetle, this adaptation has been carried to an extreme as the antennae actually split each eye in two. The Milkweed Beetle is an herbivore. 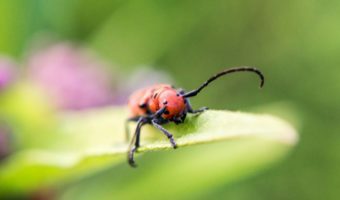 The Milkweed Beetle is given this name because they are generally host specific to the milkweed plant (Asclepias), meaning that they live on and eat from it. 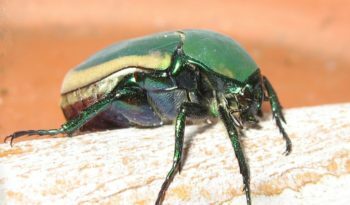 It is thought the beetle and its early instars derive a measure of protection from predators by incorporating toxins from the plant into their cell structures, thereby becoming distasteful, similar behaviour to the Monarch butterfly and its larvae. 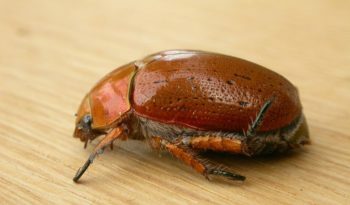 The red and black colouring may be aposematic (most commonly known as warning colouration), advertising the beetles as inedible. There are many species of insect that use the toxins contained in the milkweed plant as a chemical defence. Two different species of milkweed bug in the family Hemiptera, Lygaeus kalmii and Oncopeltus fasciatus, are coloured with bright orange and black markings. The milkweed leaf beetle shares the same colour-scheme as the milkweed bugs and the Monarch and Viceroy butterflies. Predators therefore are thought to shun any insects with these colours.